If you long for a time when our phones didn’t scan our faces or cost $1,000, there’s a new handset coming for you. HMD Global has launched another new Nokia 3310, and this one brings 3G speeds and a 27-day battery. And it’s coming to the U.S. When Nokia showed off its 3310 reboot at Mobile World Congress earlier this year, it instantly created buzz. Not only was our favorite candy bar handset from the 2000s back, it also brought an updated design with a 2.4-inch screen, a removable battery, and a MicroSD slot. But it had problems, too. It didn’t have a touch screen. It didn’t run Android like the other Nokia phones. And, most importantly, it was tied to 2G networks, which meant U.S. buyers were locked out. We do know that the handset will be an Australian exclusive at first, where it will cost $90. HMD has also confirmed that the international Nokia 3310 will cost 69 Euros, which works out to around $80. The Nokia 3310 looks cute and all, but it doesn’t do much. However, even for such a low price, the U.S.-bound Nokia 3310 doesn’t offer much beyond nostalgia. It still runs the Nokia Series 30+ operating system (which now has a customizable UI), but most people would rather have an Android fork. Plus, it only has a 2MP camera and only features a small handful of apps. And it doesn’t have a touch screen or Wi-Fi. It does, however, come in blue, yellow, red, and charcoal, and includes an upgraded version of the classic Snake game. So there’s that. For comparison, the Jelly phone has the same 2.4-inch screen but also brings a full version of Android Nougat, 4G networking, an 8MP camera, and GPS. The Nokia 3310 is cute and kitschy, but I can’t imagine many people actually buying one—or loving the one they’ve purchased. Nor do we know whether it’ll be sold through any of the major U.S. carriers. Even with Nokia’s branding, HMD has struggled to make inroads in the U.S. cellphone market. The Nokia 6 is the only HMD Global handset on sale in the U.S., but it’s only available through Amazon, and only for AT&T and T-Mobile customers. At $180 (with lock screen ads) it’s only $100 more than the Nokia 3310 price tag, and you get a full-featured smartphone running Android 7.1. 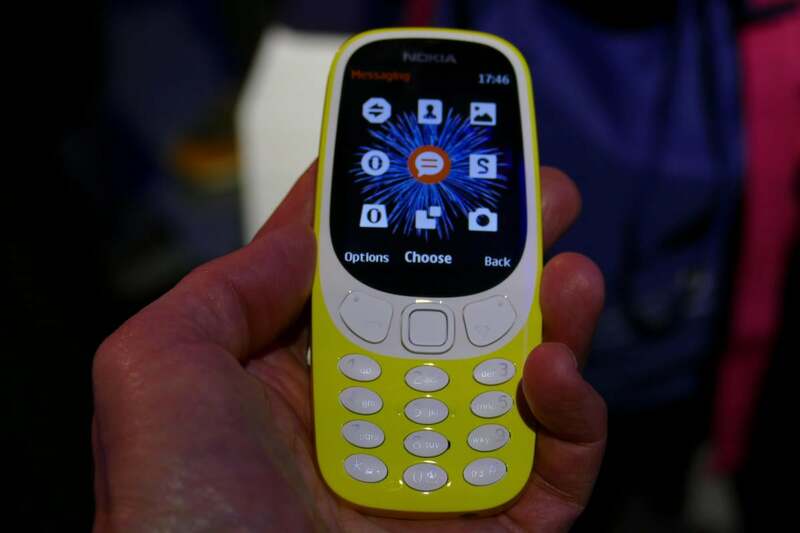 During the introduction, HMD Global chief marketing officer Pekka Rantala said the Nokia 3310 will appeal to people who want “a summer phone... a festival phone, and... an object of desire.” This seems like an awfully small niche, but I get what he’s saying. The Nokia 3310 could appeal to smartphone users who want a limited phone to take on vacation, or to parents who want their kids to be able to call them. But even then, it’s probably not worth it. Most of the carriers have already begun to transition to 4G LTE exclusively, and there’s no telling how much longer 3G networks will be reliable. And like the Nokia 6, it’s unlikely to work on the Verizon or Sprint spectrum. So, while the Nokia 3310 may be cute and cheap, even at $80, it’s hardly a bargain. But, hey, if you really want to play Snake using hardware keys, then it’s probably the phone of your dreams.